Donald Trump has come up with a new line that he is using both on Twitter and in his public appearances. He keeps repeating that our country is full. Of course that’s a lie, and the president’s own immigration policies prove that he knows it’s a lie. The reason the Trump administration is doubling the number of temporary worker visas is because this country is actually experiencing a significant labor shortage. The Economic Innovation Group (EIG)—a think take developed in 2015 by a number of high-profile tech entrepreneurs—recently released a study which suggests that the country’s biggest economic challenge could be demographic decline. 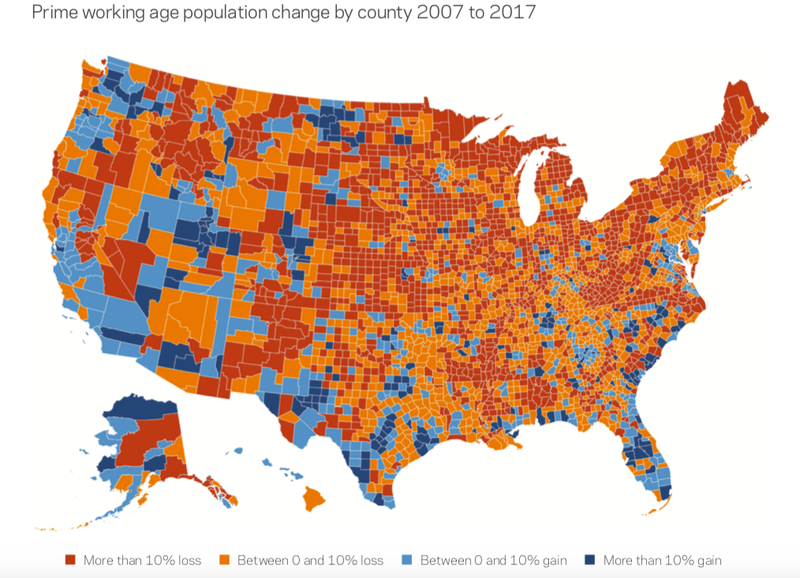 One of the most striking visuals was this map of changes to the working age population over the last 10 years. The country now adds approximately 900,000 fewer people each year than it did in the early 2000s. 80% of U.S. counties, home to 149 million Americans, lost prime working age adults from 2007 to 2017, and 65% will again over the next decade. By 2027, 26% of the population in the fastest shrinking counties will be 65 and older compared to 20% nationwide. Population loss itself perpetuates economic decline. Its deleterious effects on housing markets, local government finances, productivity, and dynamism make it harder for communities to bounce back. Writing about this report, Neil Irwin noted the downward spiral that can take hold in areas that experience population loss. A shrinking supply of working-age people can prompt employers to look elsewhere to expand, making it harder for local governments to raise enough taxes to pay for infrastructure and education, and encouraging those younger people who remain to head elsewhere for more opportunity. As the map above demonstrates, this problem is particularly acute in what is commonly referred to as the “heartland.” What is most notable is the way that map resembles the results of the 2016 election by county. Areas of the country that are thriving because they are exempt from the downward spiral of population loss tend to be those that support Democrats. That is why Daniel Block recently wrote about how the monopolization of our economy drives population growth to large coastal metropolitan areas, leaving the heartland behind. According to William Frey at Brookings, that trend might be mitigated as the economy continues to recover from the Great Recession (emphasis mine). The map also shows growth in the working age population in areas where immigrants are concentrated (California, Texas, Colorado, Nevada, and Florida). All of this suggests that, contrary to Trump’s lies, the county isn’t full and immigration could be the answer to combat one of the biggest economic challenges we face.